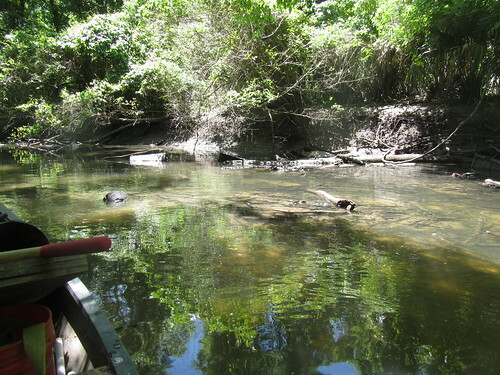 The bayou’s quite low, so we planned to have a day of working the shallows. Then we got a message about a new obstruction. Thankfully, it wasn’t that bad. If you count the rings below the bridge/pipe, you see that the actual level was about 6.3 feet below the bridge. Meanwhile, the Bluebonnet gauge was still sitting around 3.45 feet, which would be about a foot and a half higher than the level at Highland Road Park. So, if the Bluebonnet gauge is reading 4 feet or better, it’s more or less usable as an estimate and you shouldn’t be bottoming out anywhere. If it’s down to 3.5 or so, the bayou may be considerably lower, with the chain gauge giving a better idea. 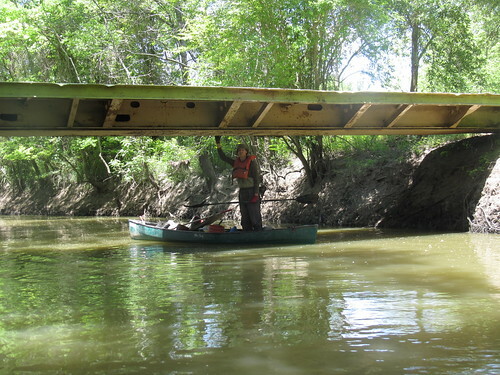 So, with the bayou over six feet below the bridge, we expected to have a bit of work in addition to the reported obstruction. This is the lowest we’ve seen it in six months, and if we get some rain again, it should hop right back up. In the meantime, we have access to quite a bit that would normally be submerged. 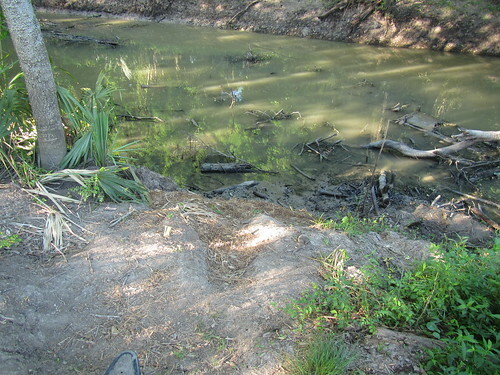 The photo above, for example, shows the bayou right at the launch point. (That’s an inverted couch, in case you’re wondering.) We haven’t pulled the logs and raked the silted-in branches here yet, as even in low water, they tend to be an advantage at the moment — they give you a bit of not-completely-mud footing, after all. It was only around half a mile of paddling to get to the reported blockage. (Thanks, David, for the heads up on Friday.) We were set for another epic winching, but on arrival, it turned out that the situation called for a different approach. 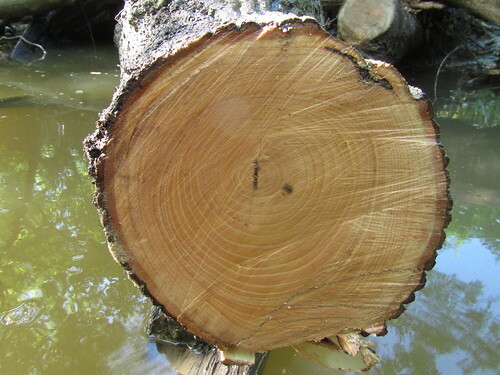 The main tree down was quite effectively containing several very substantial additional trunks that would be quite inconvenient to have floating down the bayou and causing new obstructions. That being the case, we decided to leave the new tree as an effective holding point for the big stuff and go with saws to open up ample space on the downstream-left side. This also made it a much faster job, as it only took one hour to saw through the various pieces. Continuing down the bayou turned up no additional obstructions. At these very low water levels, occasional shallows are the most significant work item. 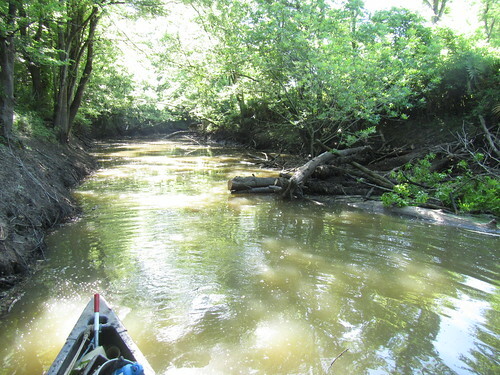 Still, there was only once where my canoe slid to a stop on silted-in branches and such. There are a few shallow spots here and there, and choosing the wrong line can at time run you aground. If that happens, you simply back up a bit and choose a different path, but it shouldn’t happen often. Where we find shallows, we’ve been going at them with long-handled four-tine garden rakes. 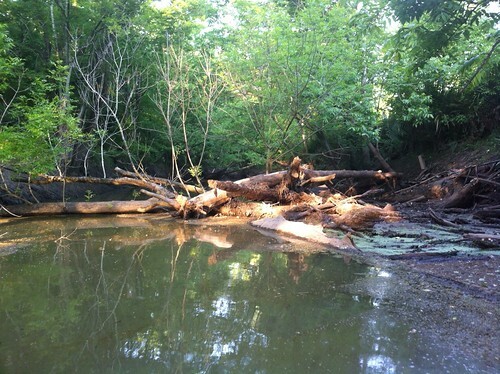 A few minutes of raking the branches and limbs out of the silt is usually all that’s necessary to clear out the silting that was caused by previous blockages which are no longer present. We’ll keep that up whenever the water’s low so it keeps getting better. In spite of the few shallow spots, it was a nice paddle down to Bayou Manchac and back. 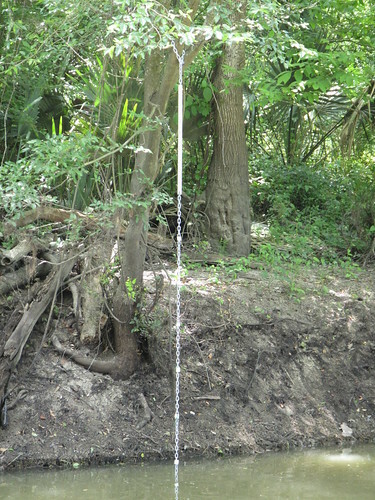 Not only was the water quite low, indeed, but it was also considerably closer to transparent than normal. It’s not every day on the bayou when you can watch turtles, gar, and plenty of small fish going about their business under the water. 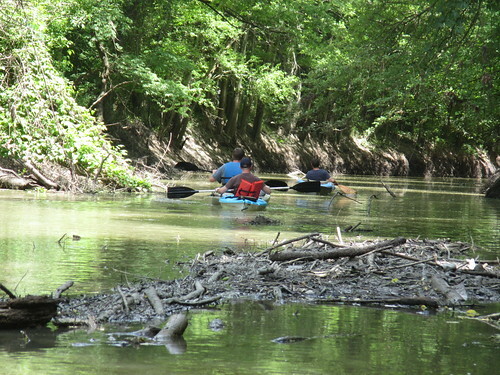 It certainly wasn’t quite like paddling over a crystal clear spring run heading to a scuba dive in Florida, but for Louisiana, it was something else. Even with the water this clear, I still wasn’t able to catch a second glimpse of the alligator I saw slink off a shallow spot into the bayou 2-1/4 miles down from the park. 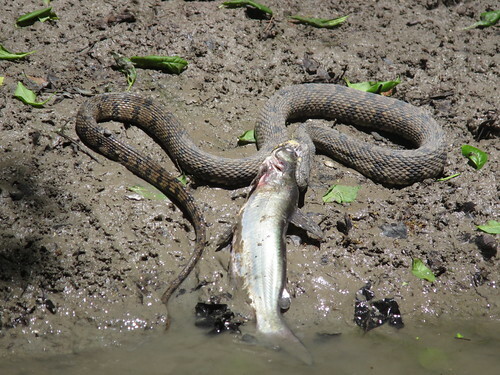 As a consolation, however, I was able to spend a few moments watching a snake work on eating a fish. The bayou is mostly clean of litter, with just a few pieces here and there left over from the cleanup. There are multiple barrels, including at least three orange construction zone versions, but there’s currently not enough water to make another Canoemaran run. We may pull a few of them and tie them off for future collection when the water’s not *quite* so low. Still, for the most part, the bayou’s looking quite respectable and is still quite usable even with the very low water of late. It’s becoming completely normal to see other people out paddling the bayou, and this trip was no exception. Three were launching as we were wrapping up. A person I met who’s been doing a project at the park told me that ever since the media coverage started in earnest, he’s seen the number of people out paddling the bayoureally pick up. I know I’ve talked to many. Hopefully we’ll have some rain soon to bring the water levels back up a bit (the sticks in the foreground above are normally well under the surface), and we’re still working toward getting some more convenient paddle access from Highland Road Park (and others, even). 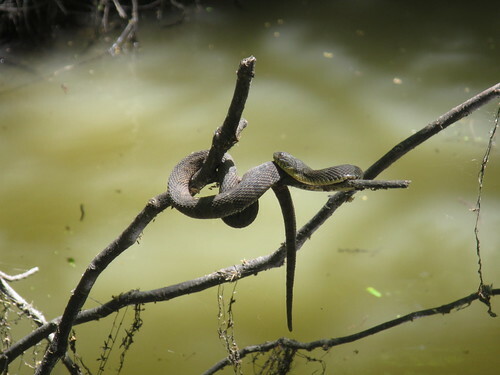 In the meantime, we’ll be back out next weekend, whatever the water level, enjoying the bayou and making it better.